Squamous cell carcinoma (SCC) is the most common form of skin cancer on the hand comprising 78% of all hand skin cancers. 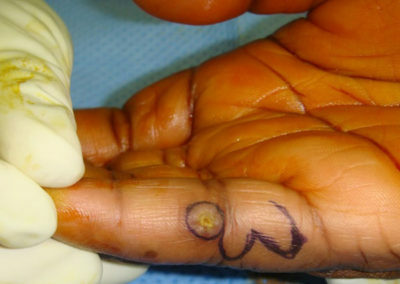 More than 95% of these occur on the back of the hand. They often start with a slight rough raised area which continues to grow both horizontally along the surface and eventually vertically down into vital structures of the hand. When a lesion spreads to lymph nodes and beyond the SCC may become limb or life threatening. The cause of SCC is most often due to ultraviolet sunlight damage. These cancers are normally pain free but the lesion may bleed or ulcerate over time. Early elimination of small SCC with surgery gives high cure rates. Edges are checked for tumor under a microscope before the wound is closed to make sure no residual tumor remains. 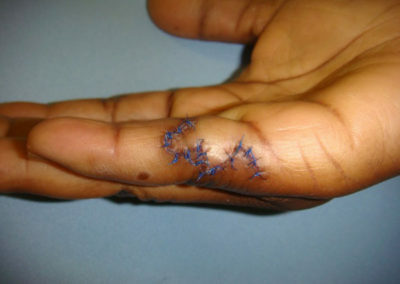 When SCC grows large, skin grafts or flaps which move in more tissue are used for reconstructing the hand. 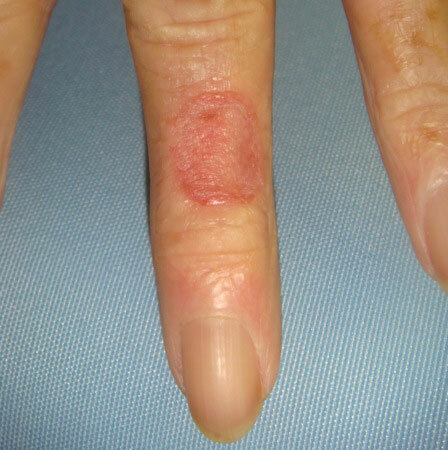 Basal Cell Carcinoma comprises around 12% of skin cancers on the hand. It grows locally destroying skin and underlying vital structures. Normally it does not spread to other areas. They appear as red or extra pink areas with apparent thinning of the skin. The margins may appear slightly raised with an almost translucent appearance. These edges contain fine collections of very small blood vessels with eventually ulcerations developing in the center. These tumors also occur 95% of the time on the back of the hand probably because of sun exposure and damage over many years. There are various creams and freezing treatments including lasers, which can cure these lesions in the early stages. Later, outpatient surgery that involves microscope examination of the specimen margins may give high cure rates. The closure of these wounds may then be completed with confidence that all the tumor is gone. Good follow up to detect early areas of concern are the best prevention. Melanoma is the form of skin cancer with the greatest involvement of the ends of the fingers and palm of the hand. 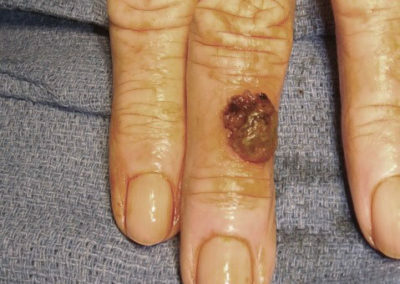 Only about 4% of all skin cancers on the hands are melanoma. 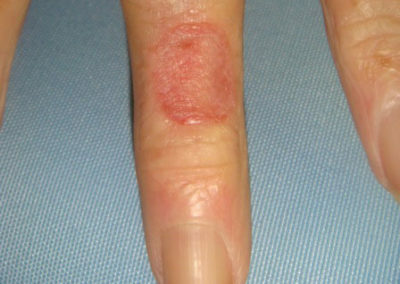 Growth under or around the fingernails may mimic other conditions. Melanoma may spread early since these have higher rates of metastases than basal or squamous cell carcinoma. The thickness or depth of the melanoma can only be determined by biopsy. It is the primary predictor of spread beyond the original location. Treatment depends on thickness and size. 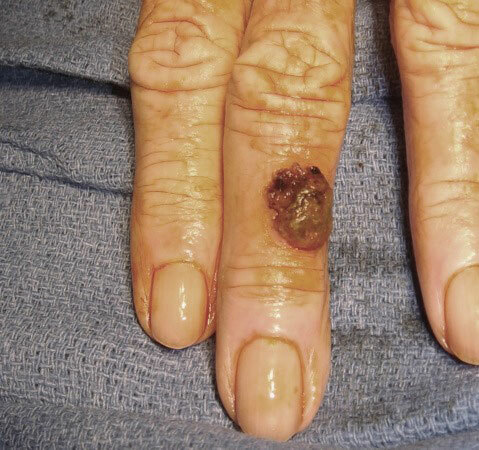 Some melanoma called amelanotic melanoma may not have the traditional black color. Others may have only a light brown spot as in the form called lentigo maligna. Surgery is the primary form of treatment for melanoma. The least amount of surgery is when these forms of cancer are detected early. Lymph node biopsies are done when thicker melanomas are found. Excessive ultraviolet radiation is a known cause of these tumors. There are other rare cancers which may affect the skin of the hand but will not be discussed in this article. Read more information on Skin Cancers HERE.